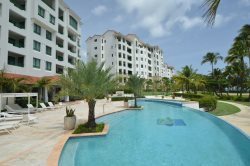 This corner unit condo, located at Rio Mar Village in the Grand Wyndham Rio Mar Beach Resort, offers relaxing views of lush green areas and the golf course. It is a garden level unit surrounded by beautiful gardens. We offer you all the comfort you and your family needs for an unforgettable getaway. This villa has 2 bedrooms with a capacity of up to 6 guests, 2.5 bathrooms, living room, dining room, complimentary WiFi and Cable TV, plus washer/dryer and fully air conditioned throughout the unit. Some of the outdoor facilities include: A beautiful Pool with lounge chairs and additional seating areas, playground for children and 24 HOUR SECURITY in the Rio Mar Village Cluster. Guest also have access to the members beautiful beach front pool with Cabana and lounge chairs. This pool has a staffed bar during the weekends. Adding to its exclusive ambiance are the amenities provided by the Rio Mar Beach Resort & Spa, A Wyndham Grand Resort. Over 500 acres of beautiful land and miles of golden sandy beaches, two beautifully designed golf courses, a Tennis Center, Spa and Fitness Center, over 12 restaurants, lounges and entertainment venues, casino, and quaint shops and boutiques. *We offer optional daily housekeeping and chef services upon request. Ready to explore Puerto Rico and participate in exhilarating adventures? Full AC throughout the condo. Guests can enjoy most of the amenities from the Grand Wyndham Rio Mar Beach Resort which includes the beautifully designed golf courses, tennis center, restaurants and more.